Eden Construction (NW) Ltd is a well-established Civil Engineering and Construction company based in Wrexham, North Wales. We supply a wide range of Civil and Construction services; we are experienced in full turn-key projects, general construction and maintenance. Not only covering the North West, we offer our services nationally. 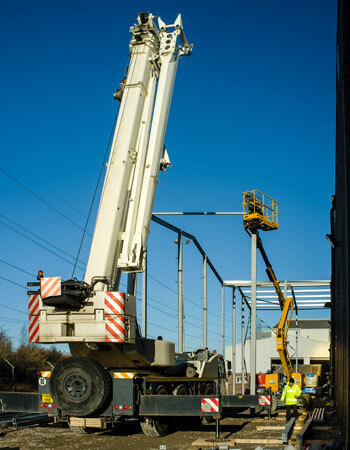 Offering all of our services to the Industrial, Commercial and Domestic sectors, we have extensive experience in all fields from groundworks to steel fabrication. Our aim is to provide a professional, courteous and efficient service, managing all aspects of any job, providing our clients with complete peace of mind. We understand that cost and quality are the key elements to any job, and we strive to ensure that we are the most competitive whilst also guaranteeing that the work is finished to the highest standard. We also place a large emphasis on Health and Safety, making sure that all works are carried out in a safe and secure manner. Being ‘Safe Contractor’ Accredited means that we have all systems and procedures in place to ensure this.